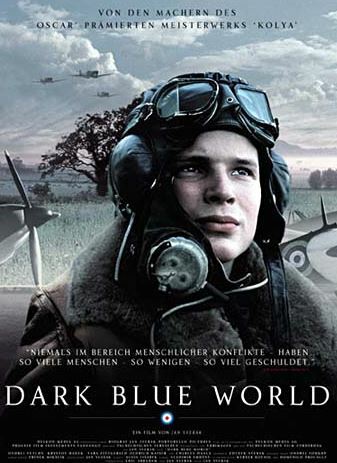 Dark Blue World, or Tmavomodr svet as was originally known, is one of the best movies released in the year 2002. The 8 time award-winning and seven-time nomination movie was primarily acted in Czech Republic and released in the UK. Its story line fits into exactly 1 hour and 52 minutes of view, with the viewer’s having to enjoy a series of war, drama, romance and action, which are basically the genre classifications of this movie. Dark Blue World is majorly based on the friendship of two men being put to test when they get to fall for the same woman. These roles are well stared by Ondrej Vetchy, Krystof Hadek and Tara Fitzgerald, who are the main characters in the movie. The rest of the cast, speaking in Czech, German, English and Slovak, does not disappoint in making the flow of events real and logical. This is all thanks to the Biograf Sveark, Ceska Televize and Dark Blue World companies (including a list of many others) who put together the cast and managed to come up with a very impressive movie. The Movie kicks off with the Germans invading Czechoslovakia on the 15th of May, 1939. The Slovak and Czech pilots manage to escape to England where they join the RAF. Upon the war ending, these pilots return home, where they are placed in labour camps with the major suspicion being that they bear anti-communist ideas. The movie progresses from the time Franta is a prisoner in the post war camps to the time he is England at the time of war. During this time, Franta acts as a big brother to Karel, who is a young pilot. Karel happens to crash-land right into Susan’s rural home, whose husband has been missing. Susan spends a night with Karel, who immediately thinks he’s found his better half. Susan however gets attracted to Franta which makes the whole plot quite dramatic in the way the two friends handle one woman.